Since 1985, LMU students have been making the 145-mile journey to Tijuana, Mexico through the De Colores program. 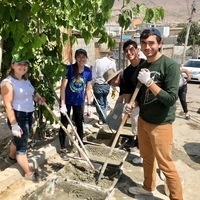 These faith-based service-immersion weekends can be a transformative experience of stepping beyond borders; physical, cultural, linguistic, and personal. Our student participants leave behind the comforts of the LMU campus (including their cell phones) and step into a different reality where the Mexican people become their "professors" and their hearts and minds are challenged to act for change. During the weekend, students will have the opportunity to partner with Build a Miracle and work on a construction type project for a local family. Students will then be able to spend eat lunch and spend some time with a loving community of families in El Florido. Then, students will have dinner and converse with migrant men at Casa Del Migrante. Throughout the weekends, students will be invited to reflect on their experience. Our hope for all student participants is that they return home with a more informed awareness of the world's greatest injustices and a deeper sense of gratitude. Student applications may be accessed here.